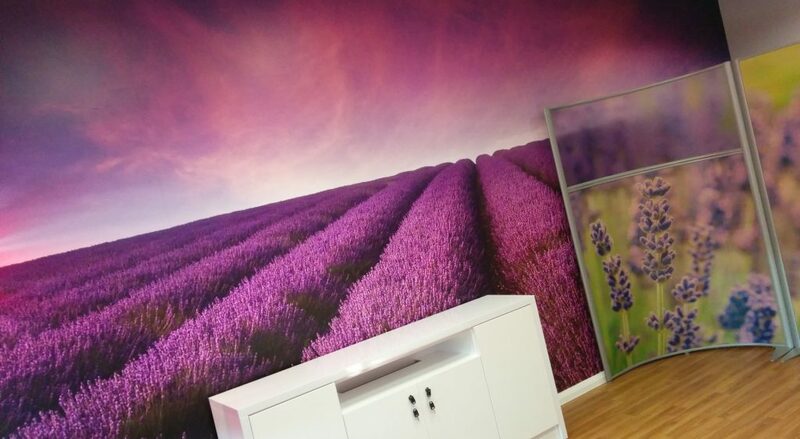 Wall Glamour® specialise in photographic wall murals and architectural graphics for interiors. We love working with commercial interior designers and architects to create unique spaces for the business, education, health and the leisure industries. Wall Glamour® started life as an online shop. We designed and made our own wall stickers and sold thousands into homes all over the UK, Europe and the rest of the world. Our success led to enquiries from commercial interior designers, and took us in a new direction to where we find ourselves today. Our commercial work has been varied, helping businesses to promote themselves and products, and making offices inspiring places to work. We have installed graphics and murals in Universities, Gyms, Retail Environments, Schools and Hospitals. And our clients have won awards for the projects we have contributed to. Do you have any questions that we haven't answered? If you are a designer, architect or a facilities manager that requires wall graphics for a project please do not hesitate to call or email us we’re more than happy to discuss your projects in confidence. © 2015 Wall Glamour®. All Rights Reserved. Wall Glamour is a registered trademark of Dogtooth Ltd.
We love to share the work that we do, in the hope that it inspires other people to think about how they can change the walls around them. We won't spam you, but we hope we can help you develop your own ideas.